It's been another very busy week for me with work but there has still been time to find some smiles to share with you.....I hope you like my new header. It was a rose bought and named specially for me last year for my 60th birthday and it's such a pretty colour. A special moment between little Theo and his Grandad....they were playing peep through the holes in the side of the ball pit and laughing together....precious memories. Steve has started kick boxing classes and is really loving it....I will say that the front teeth were missing before he went and not a result of going. I'm rather excited at the prospect of having just a few fresh veg and although our garden is only small we have managed to find space for them all. 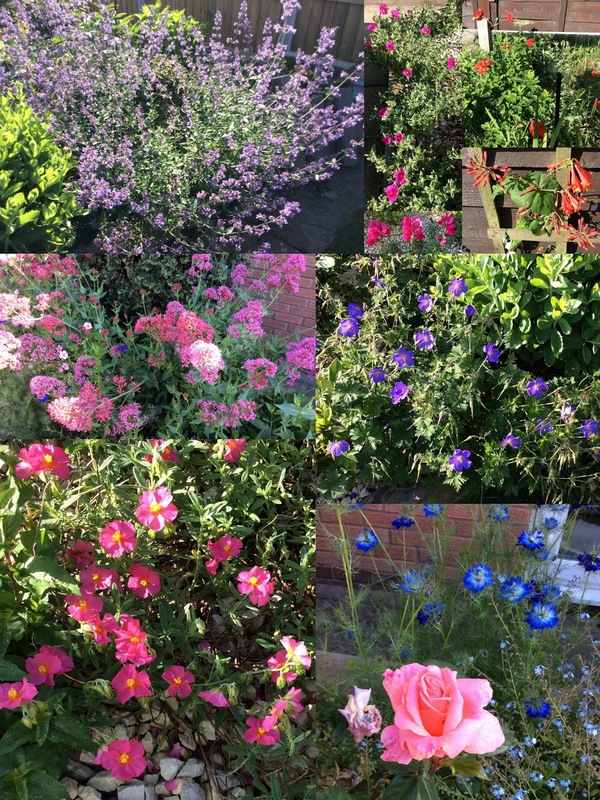 Yes the garden is only small but its full of colour at the mo.....these are just this weeks new blooms to share with you all. That's all from me for this week folks. I wont be posting my smiles next week but hope to have many more smiles to share with you the following week. Please leave me a little comment so I know you've called by and then share your own smiles by linking below. I didn't see Theo at first. He was camouflaged in the "pit." Had to laugh at your comment about Steve and his missing two front teeth. Precious photo and great pose, too. Gosh, Annie, your garden is FILLED with beauty and color. What an amazing burst of beauty, and those tomatoes and the cuke are doing well, too. Have a great Friday and weekend, too. your new header is gorgeous - love the rose, but I adore the cornflowers in the background, lol!! great pics. Hi Annie. I love the picture of Theo playing with Grandad. Such precious moments. I'm not keen on kick-boxing, but it is good to see the children enjoying a physical activity of any kind. Your new heading is stunning. I always had nigella in my garden, even when I just had a little 'patch' as a child, and every year i collected the seeds and planted them again the next year. Yours' are a lovely dark blue. I hope your greenhouse does well. Did you know that tomatoes and cucumbers don't really like sharing the same space? But hopefully yours will be fruitful for you. Everything tastes better when you have grown it yourself. Sorry about the bad link. I have put it right but I can't delete the wrong one. perhaps you can! I'm also here, and once I saw Angela had linked in for June 15, so did I. Hope you are having fun in the sun.